Rich: She has a well-rounded business background and over 15 years of experience in sales and online marketing. In addition to running the day to day activities of Web Savvy Marketing, she also provides full service SEO consulting, one on one SEO coaching, publishes online SEO courses, hosts a weekly SEO podcast, and teaches onsite SEO bootcamps. 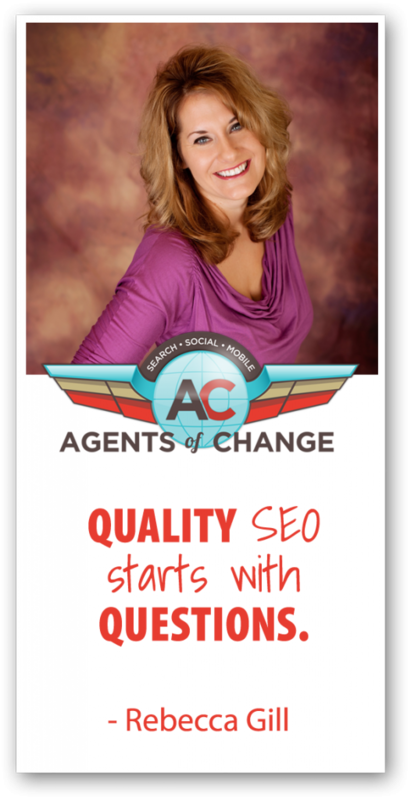 She loves to teach the latest SEO strategies and tactics to others, helping businesses grow their online footprint. Rebecca Gill, welcome to The Agents of Change. Rebecca: Thanks so much for having me here. Rich: Alright. So obviously SEO is something you do. How did you get started in SEO? Rebecca: I got started in SEO over 15 years ago when I worked for a small software company that competed against Oracle, Microsoft, SAP, and we didn’t have the big marketing budgets that they did and we didn’t have a sales funnel either. If we could get ourselves in the door and get onsite for a demonstration of the software, we would close like 90% of the time. But the problem was we just didn’t have any leads, and I taught myself SEO to fill that sales funnel. And when I did that and we executed the things that I had learned, we grew the company 400% in two years. Rebecca: We went from having a sales cycle be driven from telemarketing calls that would take a year or so to close, to people being self qualified coming into us through SEO. We already knew we were a good fit because of the way that they found us, and the sales cycle ended up in that process being like 3 months. So it was a major shift for the business and once I found that firsthand I never looked back. I just took it and ran with it from there. Rich: Well it’s nice to know you had one of those David vs Goliath success stories, because I think a lot of small businesses believe that SEO is this mysterious force in the universe. But you’re actually a big believer that people can do their own SEO. What would you say to a small business owner who says she’s too busy, or too uninformed, or too whatever, to do her own SEO? Rebecca: I would tell them that if they have at all any time to at least learn the basics of it so that they can decide whether they want to do some of it themselves, and so that they can validate anyone that they hire to do it for them. Unfortunately in our industry there’s just a lot of people who have 6 months experience at most and put up a shingle that they’re a SEO expert, charge you $500 a month, and then don’t actually tell you what they’re doing and don’t actually deliver, and sometimes it causes more damage than it does good. And that’s frustrating and the industry has gotten a bad name. But that’s not all of us, there’s a lot of us that want to do good and that’s why I always encourage end users and business owners to learn enough so they can manage the process and make sure they’re getting their money’s worth. And if they do have time and the desire to learn more of it and the execution strategy, because they really can make a difference. I do believe that anyone can do SEO and can be successful at it if they just want to take the time to learn and dig in. Rich: So you said “learn the basics”, even if you’re going to work with an agency or an outside vendor. So what would you say are the basics? If somebody said, “Listen, I don’t want to do it myself, but I also don’t want to get taken, I want to know if I’m asking the right questions and I want to know of somebody is blowing smoke.” What are the things you might point them to? Rebecca: So I would tell them right away that SEO is a process, it’s something that’s a journey and not a final destination. So you always have to be working at it in some capacity, and it’s a mix of research, strategy and planning, and execution. First and foremost if you have a consultant or even just an email that shows up promising you the world for no effort on your part and they’re just going to do this magic for you, you need to be very cautious because that’s not accurate. A real true SEO project with a consultant and a business owner is a collaboration. Nobody knows the target market better than the small business owner, and you need to have that knowledge being shared with your SEO consultant and utilize the SEO consultant to really derive value. So that’s the first thing I would have them dig into and just get a feel for really what is that process, so they know when they’re getting those offers or promises whether or not it’s a real or not or whether it’s something they should take advantage of. Rich: Ok. Rebecca, I’ve heard you say “quality SEO starts with questions”. What does that mean and what type of questions should we be asking? Rebecca: I am a firm believer in this and this goes back to when I first learned about SEO. You can’t do quality SEO unless you have a really good sense of the website you’re optimizing, what that website offers, and more importantly the target demographic it serves and what their needs are. And I always encourage people – even my own SEO projects start like this – we started asking questions of who are you, what do you do, what makes you different, what do you offer that provides value to people. And then who are you serving, what make sup this group of people that are these individuals. Are they groups, are they individuals, what do they struggle with, what are their pain points, and then how can you provide some type of value to solve those issues. And when you get to that very last question you’ve got a plan, because you know what they’re struggling with and what they’ll be searching for and I know what I can offer to solve those problems. And that’s the heart of SEO because people go to Google and go to Bring and put in search terms because they’re struggling with something, they need something, they need help. And a true SEO project is going to deliver that assistance, and it starts out with those questions. Rich: Wait, people actually go to Bing? Rebecca: They do, it’s crazy. And BIng’s actually got local profiles that you can set up and customize, too. Rich: Interesting. Ok, because I usually give 99.9% of my attention to Google, so it’s just interesting that you bring that up. So we talk about the website, we talk about what we can offer people, and who are audience is. It’s interesting because I just saw Rand Fishkin speaking the other day and he said something along the lines of, “SEO today is 75% content and 25% keywords.” So that kinda sounds like a little bit in line with what you’re talking about that you need to know why people are actually searching out a product or a service that you might be able to offer. Rebecca: Yes. And people used to focus on keyword density, so how many times the keyword has been used in a piece of content, and that’s no longer a true value. Google is much more concerned with the intent of that actual searcher, and the semantic nature of that intent, and how that relates to your content. And just a quick example. So if I go to the search engine results page and I search for “apple”, by default with just one word, Google doesn’t know whether I’m looking for the apple you eat, the Apple company, or maybe and Apple product like a laptop. But when I start to add words to my search phrase, Google gets a better idea of that and it’s going to compare that to the content it sees about apples. So if I’m looking for an apple I eat, it’s going to expect content to have freshness and taste and texture and color and things like that to give it those signals that it’s about and apple that you eat. And that’s where Google is matching up that user search intent with the semantic nature of the actual content. That is so much more important in the search than just a blanket keyword density metric or something like that that’s starting to be very archaic because Google is becoming so smart. Rich: I agree and I do think that search engines are just becoming more nuanced in understanding human language. So I think as time goes on it’s going to be people who understand their business and can write persuasive copy that are going to succeed at SEO. Rebecca: First thing I would tell them to do is subscribe to a tool like SEMrush, if it’s just for a month or two. And that is because it will give you a complete list of what you currently rank for, what content matches up to those phrases, who your true online competition is, how do they relate to you. And give you a lot of good metrics and details that you can start looking at and saying, “I’m doing well with this set of phrases and this content, but I’m lacking in this group”, and you can start to really see things that are successful and things that you’re just failing on that you can improve. I think that’s really important and that tool can also run some reports for you from a technical SEO standpoint to tell you things that you’re doing to cause issues for the search engines. And there’s a technical aspect of SEO that’s becoming more and more important today. Now you have to interpret it and know what to do with it, but it’s pretty intuitive. And even if you don’t, there’s places and there’s people you can go to to kind of help digest that for you – like with a website audit – and give you the right push towards the right direction that you need. And if you want to dig in and really learn the nuances, there’s a lot of good information in the internet. Google’s got Webmaster blog, and videos, and help guides for Webmaster, so there are places that you can dig in and get free assistance from trusted sources. Rich: So you mentioned “technical SEO”, and that is a term that’s coming up more and more. How do you define “technical SEO”, what are some of the elements of technical SEO that the average small business owner should be aware of? A year ago I’d never do website audits, I was working on one right before we got on this conversation because I’m doing at least 5 a month because it is becoming such an important aspect of SEO. You can’t have a good solid ranking in SEO unless your house is in order. When you think of it like you’re building a house or you’re going to buy a house, the house looks beautiful from the outside but the foundation underneath is crumbling and it’s a little crooked and it could fall at any moment. The foundation is the technical SEO and it really has to be in place and solid for the search engines to be able to really understand what’s going on with your content and be able to crawl through it and present you best in search. Rich: Rebecca, you bring up some painful memories. Just today I had a contractor over my new house to take a look at the half finished apartment and he just started pointing out some terrible construction things that the previous owner had done. He said he didn’t want to put lipstick on a pig here. So I understand that’s the real world version of not having your house in order. It’s like if the search engines can’t understand your website, it doesn’t make a difference in some ways how on point you are with your keywords. Rebecca: And unfortunately a lot of the websites that get built have these foundation issues, and the people that build them don’t even have a clue because a lot of developers feel they don’t need to know SEO, and they’re causing issues from through and redirects that just go in loops and there’s no destination to throwing all these images into the website and there’s no alt tech so the search engines can’t figure out what the images are about, and it just looks like clutter. And that’s the unfortunate part. The good news is there are big groups of developers who are now seeing this and wanting to learn technical SEO, so that even though they’re not doing SEO they can make their websites better for the client. And that’s a wonderful thing. Rich: And you had mentioned SEMRush, and here at flyte we use Moz. These are tools that definitely help with SEO. Do they also help with the technical aspect of it, can you do a technical audit, or is that something you’re probably going to hire somebody who knows what they’re looking for to kind of do that for you? Rebecca: So when I do a technical audit it’s like 90 data points. I do use some information from SEMRush, but then it has to be interpreted and it has to be looked at by a human. So an end user can absolutely use the SEMRush report, although it can give you false positives where you have to be, “Alright, that’s not really an issue, it’s just telling me it’s an issue”. And you can’t get freaked out by it because it is just a data tool, there’s no interpretation there. So is that a good start? Yes. If that’s all you can do is buy that tool and try to use it for that, I would encourage you to do that. But if you have the money to have somebody professional to go through it and look at it from a human perspective as well, that’s definitely more beneficial to you as a website owner. Rich: I think that’s a great piece of advice right there because I know that I have had clients who will send me some report that they got off of Hubspot or Google Webmaster tools, and they’re like freaking out. And I say we can make this change but that’s going to be 3 hours and a lot of headaches, and it looks like it’s going to save you .02 seconds on the load of a backpage. So sometimes you have to be able to take a look at some of these data points, as you mentioned, an have some context and some experience to know is this something I need to pay attention to or can I just let it go. Rebecca: I use the analogy of parenting. You have to pick your battles with your children. Granted whether they put on matching socks might be an issue to you, but it’s much more a concern to me if they brush their teeth. So I pick those battles with my kids. I think technical SEO is part of that same thought process. You’re not going to fix every single validation coding error that you see with a W3, but you want to pick the ones that matter because those are the ones that are going to influence the user experience and influence whether or not the search engines can crawl and render your page. And that takes a human with experience to be able to digest that for you. Rich: Alright, so we’ve tackled a little bit of the technical SEO stuff and some of the first steps. What do you recommend to companies as far as ongoing month in/month out-type activities? What should people be doing who want to continually improve their search engine rankings and drive more qualified leads from the search engines? Rebecca: Always be looking at your data. I’m not a big believer in telling people that they have to have a consultant on retainer every month forever working with them. Once webmasters and business owners understand the basics of SEO and what’s important, they can do a lot on their own. And that’s really continuing to look to see where you’re ranking for whatever phrases are important to you and improving that content in visual content technical aspects so that you can continue to elevate your rank. And then it’s finding new opportunities, because the world doesn’t stop, it’s not a constant that just sits still, it’s a routine. And so your website or your blog has to change as well. And that means you need to be doing an ongoing review of what your target market is looking for or what’s important to them, and then making sure that you have good content to support it. Rich: Alright. How can you tell if you’re improving, and if you are improving, is there a way that you can tell which activity you did that actually made that improvement? Sometimes it seems to be hard to connect the dots. Rebecca: I always recommend people use Google Analytics, and then use external tools like SEMRush or even Google Search Console to look at trending metrics over time. But one of the best things that you can do for yourself is learn about annotations and Google Analytics. Google Analytics is free, it’s got this option for annotations which basically allows you to just plop on a post it note inside the graph, like a data point for you to say, “On this date I changed X”. And then you keep doing those so that if you start to see data trends and things shifting, you can go back to that point in time and see what you did and what happened. And that’s really powerful. I’ve done it on blog posts before and even cases where you hire Joe to come in and he started tweaking with your SEO, do an annotation on that so you know when Joe started so if there’s an upward trend or a downward trend you can start to associate changes to individuals or activities and whatever the case may be. Because you can start to see data trends, you can be able to get to the heart of everything because there’s so many nuances to SEO and so many things when Google changes the algorithm every single day. But it will help you keep what you’re doing on track and the updates and changes you’re making so that you can see how they are impacting what’s happening with your search and your ranking. Rich: So a couple of things that seem to have gained in importance in the last few years as far as Google ranking goes is site speed and security having an SSL certificate on your website. Do you find that these in your experience are helpful, and also is there any other emerging trends that you’re seeing right now that maybe you didn’t think were as important 5 years ago? Rebecca: So having an SSL certificate for your site and having it implemented properly – I stress that last part – is critical. You have to have that, Google tells you you have to have it, expects it, and is going to start throwing warnings for not having it. That’s a must have and it needs to be implemented correctly, it’s not just a switch. You’re going to have to spend a couple hours or hire someone for a couple hours to go and update URLs and set up things to make sure it’s correct. The performance that’s getting increasingly important with the search engines and with users because we’re on our mobile devices more and more. We’re on mobile searching more than we are on desktop, and then you have search engines bringing in this new user base from third world countries who they don’t have desktops they only have mobile devices, they don’t have high speed broadband internet, they have mobile data plans that are super expensive that aren’t super fast. So all of those users have to have fast websites to be able to get to and it’s the only way they can get to continue to use search engines and for search and access them. So it is important because that’s Google’s money maker, it’s a whole new audience Google is bringing in to get ad revenue from. So if we know it’s important to Google we know it’s going to be important to us regardless of whether we serve that market or not. And it’s not going to go away, it’s just going to continue to escalate in my opinion for both the need for it and then the attention we’re going to place on it. Rich: So those two are definitely important. Do you see any other trends though, is there anything else that you’re seeing out there? Like a few years ago I wouldn’t have cared about this, but now I do, or the reverse of that, are there things that just a few years ago you would have said pay attention to this and know you’re like, not so much? Rebecca: So accessibility is one that I admit – and I feel bad about this – I didn’t pay attention to years ago. And we even do custom website design, it just wasn’t something that was talked about much. It is talked about now, Google’s got documents out there that says accessibility is the responsibility of everyone, you need to take part. That’s their mantra and they’re talking about it more and more, it is going to influence SEO. When you think about it, the search engines are similar to a screen reader and the fact that they can’t see websites like a human, they need those data points, and when you start to look at accessibility and do audits of that you’ll see what issues you’re causing. So that’s definitely one that people have to take more and more not to and make sure that their websites are accessible. And that’s both for humans and for search engines. Things that have gone away I would tell you is like that keyword density. It’s not like the metric and it’s not used like it was before. The fact that before we used to really have to focus on one keyword phrase per URL, now you can rank like hundreds of keyword phrases for a URL. When I teach people in my online course I don’t start that, I start them with one so they can get the process and learn the basics. But then once you have that now, because Google is so smart, it understands the difference and synonyms and things like that so you can do a lot of ranking on one piece of content. And that’s definitely a shift and it changes the way we view keyword research and site mapping and optimization in today’s world versus what it was in the past. Rich: Well that raises an interesting question that I have at least. So maybe in the past if you’ve been doing this for a while, maybe you have 10, 15, 50 blogs out there all about different nuances around a specific topic whether it’s SEO, email marketing, dog training, gluten-free muffins, and now you’re looking at this and saying I probably could rank for a bunch of terms off of one page and I’ve just got all these pages hanging out there and maybe I should be condensing all these pages. Do you ever recommend to a client that they maybe take a look at some of their old posts and maybe redirect them towards a better post that maybe has more incoming links or anything like that, or do you just always say with the blog that you created it, it’s out there, just leave it alone and we’ll refocus the attention somewhere? I’m often concerned that if we have too many blog posts around a certain subject – in the old days I thought that was brilliant – now I’m wondering if we’re almost diluting our visibility with that approach. Rebecca: We’re diluting our visibility and we’re competing with ourselves. And I’ve said that before, don’t compete with yourself. You need to really have a focus for keyword phrases and what that destination is, because if you don’t know it neither does the search engines. So I’m working with one client and they’ve got a lot of posts and they were smaller posts but they were on the same subject, and it was like part one, and part two. And I’m like, no, we don’t want part one and part two, Google doesn’t want that nor does humans. We want to combine those into one really good post that has good, solid structure so that it can rank better. So that is definitely something that I recommend that after this call I’ve got to get back on for them. So we do want to do that, we want to have longer form content. The average page I’m ranking for now is about 1,700 words. Five years ago it could have been 500 words but it’s changed now and all of those smaller posts are going to struggle ranking in today’s smaller environments, so you have to go back and look at what you have and see how you can make them more robust and how you can potentially optimize them. A great way to do that is to look at your Google Search Console or even tools like SEMRush. Look at the ranking per page to see what phrases are there and look to see what you’re not on page one of. There’s going to be phrases on page two that Google sees that you could rank for that but it’s just not strong enough. And then you can look at those phrases and look at your content and say I can bring that phrase better into that content and explore it further, which would augment that content to make it longer and make it more useful for people, as well as make a better opportunity for it to rank in search. Rich: And if you take some of those lesser posts – whether they’re older or not – would you just recommend creating a redirect to point the search engines to that newer, better content? Rebecca: Yes, absolutely. Whenever you change any type of URL structure you always need a 301 redirect because that will preserve the traffic and it will redirect your SEO value up to the point of 99% or something. It’s crazy how much the search engines adhere to that 301 and transfer all that goodness for you. Rich: Alright. You had mentioned SEMRush earlier, what are any other SEO tools, plugins, or services that you just absolutely just can’t live without? Rebecca: So I love SEMRush, I use it daily. I love KW Finder, it’s another one for keyword research, it is my “go to” tool. Both of those I think I would sell my oldest child if I had to get rid of those because I love them so much. DYNO Mapper is a wonderful tool for larger sites to be able to crawl the site and give you some good information, especially visually. Screaming Frog is another one for crawling and really giving you massive amounts of data. The Moz toolbar is great for seeing your content at a quick level as in the eyes of the search engines, because it will pull out key metrics for you and key data points and you’ll see issues you didn’t even know where there. If you’re using WordPress, Yoast SEO plugin, and both the premium as well as the local plugin to create that schema and structure data for small businesses that focus on a specific geographical location. Those are all my must have tools that I live with and breathe and love on everyday in my world. Rich: Sounds good. That was actually a great collection, there were a couple in there that I know and am very familiar with, a couple others I’m definitely going to check out, especially the DYNO Mapper for larger site because we’re about to redo our own website and we’ve got over 2,000 blog posts out there and a lot of them I’m just like I don’t know that I need 2,000 blog posts. Rich: I’m sure a few of them are just awful at this point. Rebecca: And DYNO Mapper will export everything to Excel and you can actually see the word count and the meta and the page title and things in Excel. And you can sort it and filter so it becomes really powerful. And I always use it everytime we do a redesign for somebody, that’s the tool that I use for the 301 redirects, is to really crawl the site because they never know how many pieces of content they really have out there but DYNO Mapper does, and it will give me a real full comprehensive report of that. Rich: That sounds great. This has been fantastic. Rebecca, I really appreciate your time. You mentioned you have some SEO courses, I’m sure people want to dig a little bit deeper and check out your stuff, where can we send them? Rebecca: My personal site is rebeccagill.com, that leads to all of my other websites. My courses are at diyseocourses.com, and they’re really geared towards the DIY person who really wants to just dig in and learn a good process and do SEO on their own. Rich: Fantastic. Rebecca this has been fabulous, I appreciate you stopping by and sharing all your expertise. Rebecca: My pleasure, thanks so much for having me. Rebecca Gill loves teaching SEO tactics to businesses to help them grow their online footprint. Her classesare perfect for the DIY’er wanting to learn good processes that will allow them to do effective SEO themselves. Rich Brooks is the President of flyte new media, a web design & digital marketing agency in Portland, Maine. He knows a thing or two about helping businesses grow by reaching their ideal customers, and to prove that, he puts on a yearly conferenceto inspire small businesses to achieve big success. You can also head on over to Twitterto check him out, and he’s also added “author” to his resume with his new book!